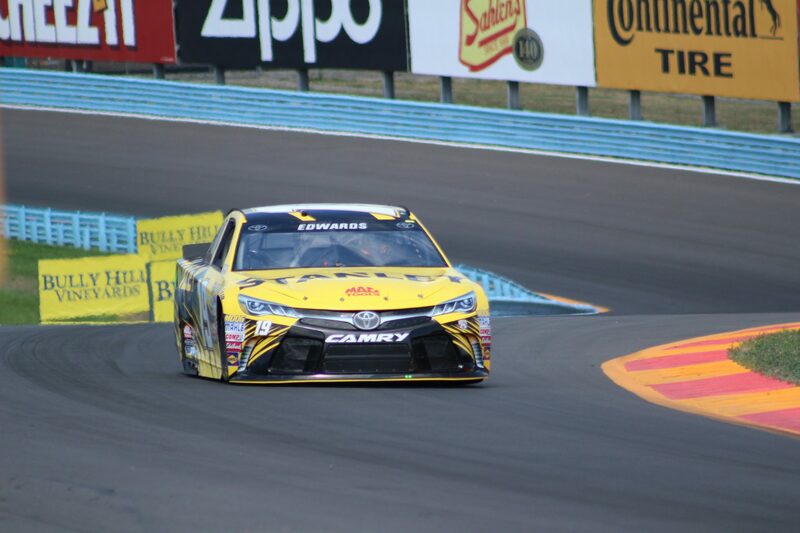 WATKINS GLEN, N.Y. — Prior to the Cheez-It 355 at the Glen weekend this week, Watkins Glen International embarked on a massive repaving project that tore out the entire racing surface and laid brand new asphalt and curbing in the corners. WGI laid an amount of asphalt equal to laying twenty-two miles of asphalt on a two-lane road, including the NASCAR circuit and ‘The Boot’, which is not utilized on the NASCAR course. 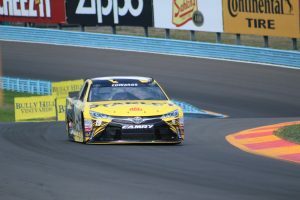 Edwards was both insightful in his commentary of the repaved course, but also took some time to rehash some rather knee-slapping moments that he has encountered at the track that overlooks Seneca Lake in Upstate New York. Edwards started Friday’s media availability with a memory of his first two testing sessions — one of which Casey Mears poked fun at him, without knowing he had done so. It just wasn’t nearly as embarrassing as when Edwards was chatting with Mears in the garage later in the day. But no, that was not all for a young Edwards, trying to learn the craft of the road course. Edwards did, however, figure out the road course at WGI. He comes into Sunday’s race with the best average finish of all drivers who have competed in the last ten WGI Sprint Cup Series races. The question still remained, though: How was the new surface and what were his thoughts after Friday’s practice sessions? Edwards thinks that qualifying will be important and set up how the rest of the weekend will go, as well as what strategies they might employ. But with the 2.45 mile road course fitted with new asphalt, Edward was asked if that changed how the team set up his Arris Toyota or how he drove the car now?